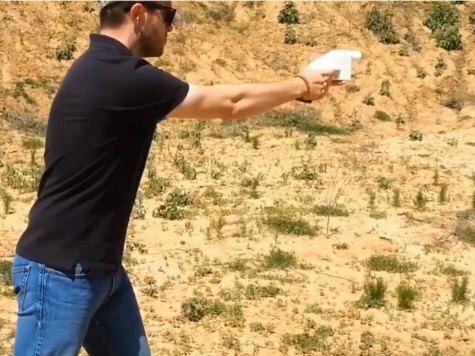 Defense Distributed has made a lot of headlines lately about the Liberator: a firearm which is completely fabricated by "3D printing", apart from the firing pin. I think the success of this gun already is that it's got politicians like Charles Schumer and Steve Israel all steamed-up about it. Schumer wants 3D printed guns to be outlawed completely. The thing is, politicos like Schumer can't figure out how to pull that off. 3D printing will soon be a household implement and if it can be drawn up on a computer, anyone will be able to produce a fully-functioning model right on their desktop. The computer doesn't care if it's a replacement part for a kitchen appliance or an action figure or a real working handgun. The barn door has been thrown wide open and there's no getting that horse back inside. Never let something like common sense stop the government from trying. Earlier today the Department of Defense requested that Defense Distributed remove all its 3D weapons-related files from its website. Defense Distributed's founder Cody Wilson is laying the blame on the doorstep of Secretary of State John Kerry. As of this writing, Defense Distributed's site has "gone dark". But less than five minutes after reading about the government having the Liberator pulled from the web, I had downloaded the gun. And not once, but twice. Download µTorrent if you don't have it already (it's a free download) and run the install. Any other torrent client should work too. I found the Liberator files on The Pirate Bay. There are two torrents for it so far: here's #1 and here's #2. If either of those can't be found just do a search for "liberator" and "gun": I got those two results at once. The file size is 2.02 megabytes (such a tiny thing for something so much fuss about). And then... just download your Liberator files! If you possess a 3D printer you can start making your Liberator pistol immediately. I downloaded the file from each of those two torrents. It is on my hard drive. It is also on at least two USB drives that I've copied it too. I can e-mail the file to anyone, anywhere in the world. I could even set up a torrent on my own and allow people to download it from me directly. In fact, it is happening right now. Not by me, but by other people. Lots and lots of other people. Shutting down the Defense Distributed website was just about the worst thing that the United States federal government could have done, if it didn't want the Liberator to get into the wild. By trying to outlaw it, the feds have made it so that practically everyone can want it. Defense Distributed could not have asked for better publicity for and dissemination of its product! I would like to know where DoD gets the authority to do anything close to this. ATF maybe, DoD never. The argument is that it's a national security issue, since making these files available online is making them available to our enemies (who we want to have as few arms as possible). It's idiotic...but they're treating this as arms trade rather than information trade, since the government still doesn't think in terms of information. Hey, if we spend lots of time on this, then we can ignore gun manufacturers making guns that look like toys and parents who leave them loaded where kids can and will use them. Yes the cat is out of the bag in regards to this weapon which might as well be custom designed for for anyone wanting to get through security points. However your glee with the whole process is downright creepy. I would rather be "creepy" than "complacent". Particularly in matters of our freedom from government intrusion of our God-given right to self defense. What, you can't protect yourself with a legally purchased conventional gun? And when someone mixes religion with possessing weapons, I'm sorry, that's creepy. What Chris said wasnt about religion. If you had understanding of this country's founders you would recognize Thomas Jefferson wrote about the inalienable rights bestowed by our Creator. Jefferson wasn't writing about religion. Jefferson was saying that rights are established by something higher than man. Call it what you wish but rights aren't given to man by man. That is what the founders were getting away from. A person has the right to defend himself from other people who would deprive him of the rights to life, liberty, and the pursuit of happiness. If you have a problem with that don't take it up with Chris Knight. Take it up with Thomas Jefferson.